If you ever have wondered where nanotechnology will take us, look no further than the potential applications in the area of functional food by engineering biological molecules toward functions very different from those they have in nature, opening up a whole new area of research and development. Of course, there seems to be no limit to what food technologists are prepared to do to our food and nanotechnology will give them a whole new set of tools to go to new extremes. For a more critical view of food nanotechnology, just take a look at "Nanotechnology food coming to a fridge near you" or "Are you ready for your nano-engineered wine?". But there are also a lot of positives. Let's take a look at the potentially beneficial effects nanotechnology-enabled innovations could have on our foods and, subsequently, on our health. According to a definition in a recent report ("Nanotechnology in Agriculture and Food"; pdf), food is nanofood when nanoparticles, nanotechnology techniques or tools are used during cultivation, production, processing, or packaging of the food. It does not mean atomically modified food or food produced by nanomachines. Where is nanotechnology used in food? Let's start with where the benefits of this will be needed most: third world countries where food supply is often limited and the quality of available food leads to nutritional deficiencies and the quality of drinking water ia a major contributor to disease. In a study by the University of Toronto Joint Centre for Bioethics from two years ago ("Nanotechnology and the Developing World"; pdf), a panel of international experts ranked the 10 nanotechnology applications in R&D worldwide with the greatest potential to aid the poor. Number two on the list was "agricultural productivity enhancement", number three was "water treatment and remediation" and number six was "food processing and storage" (read more: Nanotechnology in developing countries). Recent research has begun to address the potential applications of nanotechnology for functional foods and nutraceuticals by applying the new concepts and engineering approaches involved in nanomaterials to target the delivery of bioactive compounds and micronutrients. Nanomaterials allow better encapsulation and release efficiency of the active food ingredients compared to traditional encapsulating agents, and the development of nano-emulsions, liposomes, micelles, biopolymer complexes and cubosomes have led to improved properties for bioactive compounds protection, controlled delivery systems, food matrix integration, and masking undesired flavors. 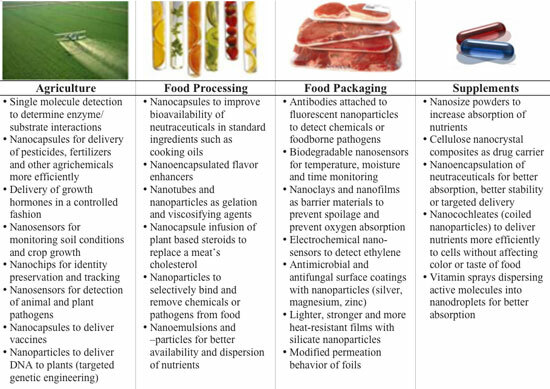 Given the increasing number of nanotechnology applications in the food industry, the ability to detect and to measure a given nanomaterial at key time points in the food lifecycle is critical for estimating the nanoscale properties of interest that dictate manufacturing consistency and safety, as well as understanding potential beneficial or adverse effects from food intercalation. 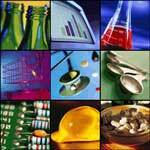 Read more in our Nanowerk Spotlight: "How to identify nanomaterials in food". "Where will nanotechnology take us?" is another, more general question, addressed in our recent book. Energy is another area where nanotechnology can be used in the future. For a more general discussion on where nanotechnology is being used today see our introduction section.